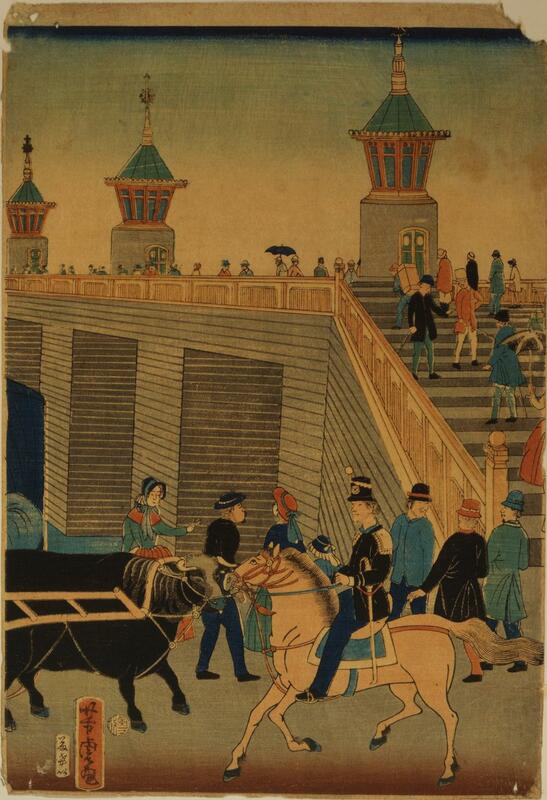 History of Japanese woodblock prints: Japanese view of London. 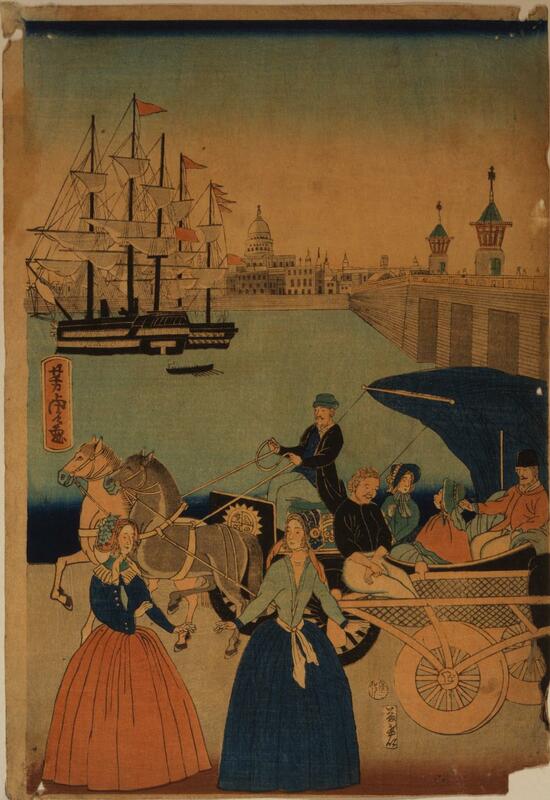 Utagawa Yoshitora’s 1866 prints “Igirisukoku Rondon no zu” form a triptych view of London. Together, the three images depict a street scene near the River Thames, complete with thronging English pedestrians, two sailing ships, horses, oxen, and carriages. 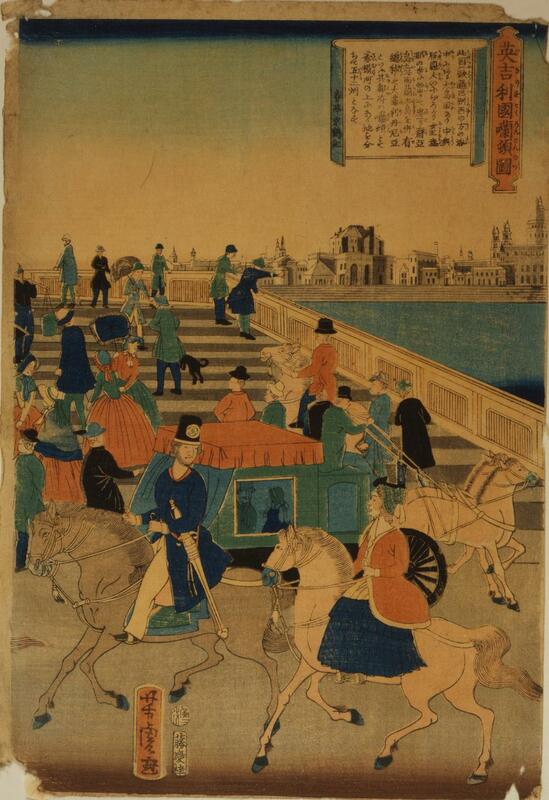 The images would have sold fairly cheaply, in the thriving market in woodblock (ukiyo-e) prints in 19th-century Japan. Utagawa, a relatively minor artist from an extensive lineage of woodblock printers, also produced portraits of Kabuki actors, triptychs of historical battle scenes, and images of foreigners in Yokohama—one of the only places in Japan where they were allowed to trade at the time. (Here’s an 1861 print titled “Two Americans.”) Utagawa probably did not visit London, and was instead working from secondhand reports. Curator Dan McKee writes of the dominance of the Utagawa lineage in the printmaking field at this time: “Ukiyo-e printmakers who were not related to the Utagawa School in the nineteenth century were the exception, not the rule.” While Utagawa prints have historically been disparaged for a “cluttered” compositional style, “a figural stereotype that was inelegant, oversimplified in line and false in detail and posture,” McKee writes that recent reassessments have reclaimed the prints, which were hugely commercially successful in their time. I first saw mention of this triptych on the Two Nerdy History Girls blog. The three images, arranged as a triptych.